A 58 year old man presents for AAA repair. During surgery, a well circumscribed retroperitoneal "mass", 3.0 x 1.8 x 0.9, is incidentally discovered. Sections show atrophic seminiferous tubules with thick basement membranes. 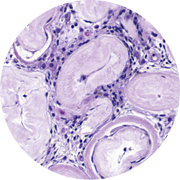 The stroma demonstrates prominent leydig cells with focal metaplastic fat. Scattered sertoli cells are also seen. There is no evidence of neoplasia. A diagnosis of undescended (cryptorchid) testis is rendered.